We enjoyed The Pink Pony so much on Monday, we went back for breakfast on Wednesday. We left Circus Circus and headed north to check out the other end of The Strip. We were going to investigate the attitude and altitude of The Stratosphere. Believe it or not, we decided to walk, even in the desert heat. What seemed like a journey of a thousand miles, heat beating down on our heads, inches from death, was really a walk of about a mile. 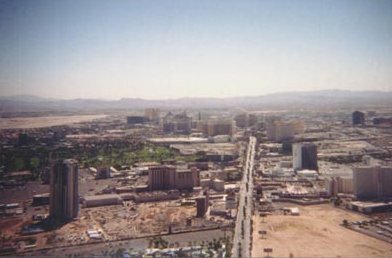 Here's a view from The Stratosphere looking down The Strip. Circus Circus can be seen in the bottom right of the photo. McCarran International Airport is at the other side of The Strip at the top left of the photo. At 1,149 feet, the Stratosphere Tower is the tallest freestanding observation tower in the United States and the tallest building west of the Mississippi River. We were whisked from ground level to the observation decks in less than 30 seconds in double decker elevators traveling at three floors a second for only $6.00 each which included a "free" drink in the bar on top. There is a roller coaster on top but it was closed. Ag, shame. We had lunch at Hound Doggie in the Riviera Casino. Wednesday evening we took a cab downtown for the Fremont Street Experience, a spectacular computer generated light and sound show. While the downtown casinos are older and smokier due to their lower ceilings, the odds seemed better. We visited Binions, the Fremont, and the Four Queens where we dined on prime rib with all the trimmings for $6.95 at Magnolia's. We all joined the Reel Winners VIP Players Club at the Four Queens and won gifts. David won a deck of cards, Diana won a shot glass, Sandy won a pin, and Harry won a coffee mug.